For those that followed my now-defunct Tumblr blog going back to its earliest days, this photo might be remembered from the time before I dedicated that site solely to retro/vintage/Americana material. I am bringing this one over here to KoHoSo.us for a couple of reasons. The first one is that I just love this picture. 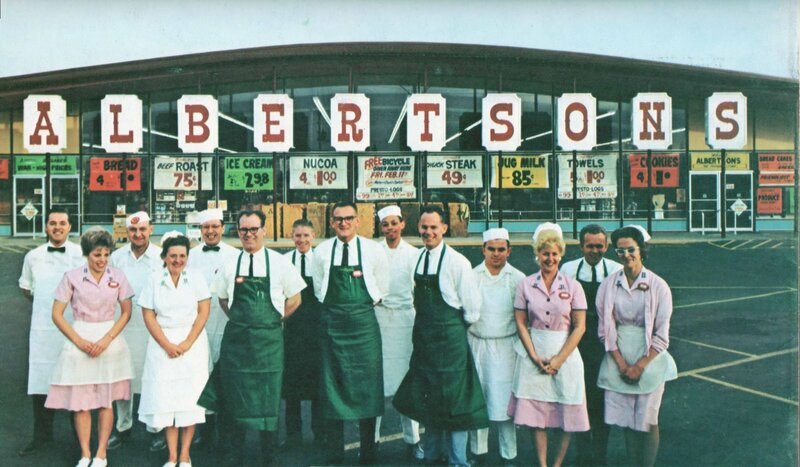 For those not familiar with Albertsons, it is a chain of grocery stores founded in Boise, Idaho by Joe Albertson. It has been a major grocer in western states for many decades and, at one time, was one of my favorites in California. The first one I remember entering was north of Sacramento and it looked just like this one — a kind of ripoff of Safeway’s famous Marina design. However, what makes this photo for me is the crew. Wherever this was, it’s easy to imagine that everybody in town knew each of these people by name and were always happy to see them. The friendly feelings I get from this picture lead me to the second reason I wanted to post this one again. This comes from one of my most favorite blogs of any subject, Pleasant Family Shopping. Although not as active as in years past, there is still no better site that gives one the feel of what it was like to go shopping during the few glorious decades following World War II. While the author, Dave Aldrich, is from the Chicagoland area and the blog often focuses there, it still branches out into other areas of the country where almost no region’s favorites are left out. Aldrich often accompanies his great picture finds with extremely detailed yet humorous histories of the department stores, discount stores, supermarkets, and drug stores he brings back to life in the days when shopping was indeed, by and large, much more pleasant. Pleasant Family Shopping receives my highest recommendation. Those that enjoy a lot of history and fun to go with their eye candy should get over there, go back to the very first post, and read the entire thing. It truly is that good. Posted in 1960s, Food, Retro/VintageTagged 1966, Americana, architecture, design, grocer, supermarketBookmark the permalink.